Although kidney transplants offer the best hope for patients with ESKD, only a small proportion of the incident ESKD population in Qatar will get that opportunity, leaving the majority to receive either hemodialysis (HD) or peritoneal dialysis (PD). HD was initiated in Qatar in 1981 and since then continued to be the most commonly used mode of RRT. PD was initiated in 1997 and used in most cases as a bridge to transplantation. Patients are allocated for PD as per the treating nephrologist's decision, considering the underlying medical conditions, patient choice, availability of HD services, and patient's ability to perform PD. The aim of this study was to assess the demographic profile, complications and outcome of our PD population. All patients in Qatar on maintenance PD from 1 January 2003 to 31 December 2007 and surviving at least 3 months on PD were included in this study. PD was provided solely by Hamad Medical Corporation and was free of charge for all patients. Data were extracted from the hospital and PD Unit medical records and entered into a specially designed questionnaire, focusing on patients' demography, outcome, causes of death, peritonitis and reasons for terminating therapy. We studied 241 patients with a total 7,209 patients months of experience. Before starting PD, all patients and their family members are educated about the procedure. A counseling session is conducted by a nephrologist and a PD nurse, where the capacity of the patient and/or family to perform the dialysis procedure is assessed. Peritoneal access, a double cuff Tenckhoff catheter, is then inserted by an experienced surgeon in the theater. Two weeks after insertion, patient and family are given extensive training about the exchange techniques, aseptic measures, ambulatory and automated PD. All patients use the twin bag system, various concentrations of dextrose solutions, icodextrin, and modern cyclers. The majority of patients are started on 2 L exchanges 4 times/day, that is readjusted later for each patient as per clinical demand to attain optimum ultrafiltration and a target weekly Kt/V urea of 1.78. Automated PD was introduced in Qatar in the year 2002; most patients use 10 L of fluid, being "wet" during daytime (Continuous Cycling Peritoneal Dialysis (CCPD)). Exit-site care consists of local application of either Mupirocin or Gentamicin cream. During the study period, all patients who had peritonitis were identified; those who died, underwent transplantation or shifted to HD were also monitored. Statistical analysis was performed using the Windows Excel program. Results were expressed as means and standard deviations for continuous data, and frequencies and percentages for categorical data. Chi-square frequency analysis was used to analyze categorized variables with a P value of less than 0.05 considered as statistically significant. Patients and technique survival were analyzed using Kaplan-Meier method (GraphPad Prism Software). Mortality was defined as patient's death while on PD. 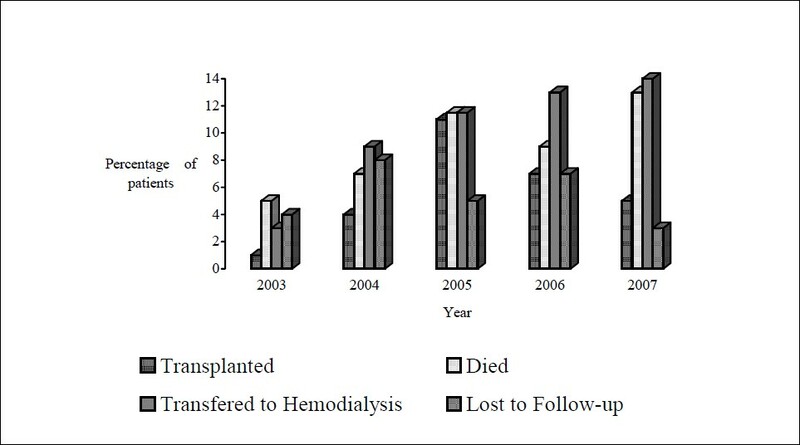 On calculating patients' survival, those who underwent transplantation or were transferred to HD were censored; on the other hand, technique failure included those who were transferred to HD or had a kidney transplant. During the 5-year study period, the total number of patients on dialysis therapy in Qatar, both HD and PD, increased by an annual rate of 6 ± 5%, from a total of 379 patients during 2003 to 482 patients in the year 2007. The mean annual expansion rate of our PD population was 12 ± 13%, representing 23 ± 3% of all the dialysis population in Qatar. The annual rate of expansion of our PD population was not statistically significant [Figure 1]. Figure 1: Pattern of patients on dialysis in Qatar. Among the PD population, non-Qatari expatriates represented 84% (71% males). The mean age was 53 ± 14 years, and those with diabetic nephropathy as their native kidney disease represented 43% [Table 1]. Most patients were maintained on continuous ambulatory peritoneal dialysis (CAPD). After the introduction of automated PD the number of those under-going CAPD or CCPD had been significantly fluctuating (P < 0.001) [Figure 2]. Table 1: Causes of kidney disease in the studied population. Figure 2: Peritoneal dialysis modalities and dropouts. As the number of incident patients increased in our PD program, a significant number of patients dropped out from PD [Figure 2]; 165 patients dropped out from PD during the 5-year study period. The reasons for dropout included death (30%), transfer to HD (34%), transplantation (19%), or lost to follow-up (17%). A significant number of expatriate patients left the country, thus labeled as lost to follow-up [Figure 3]. Figure 3: Patients dropped out from peritoneal dialysis. Our mortality increased during the study period (P < 0.01). The overall mortality included 49 patients within 5 years; 55% of these were males, 42% were between 65and 74 years of age, and 74% of the deaths occurred during the first two years on PD. Cardiovascular events were responsible of 86% of deaths, followed by peritonitis (8%), and non-PD related infections (4%) [Table 2]. Table 2: Peritoneal dialysis mortality. The number of patients who were transferred from PD to HD increased during the study period, but it did not reach a statistically significant level; most of those transferred from PD were males (77%), with peritonitis being the main reason for transfer (36% of cases). 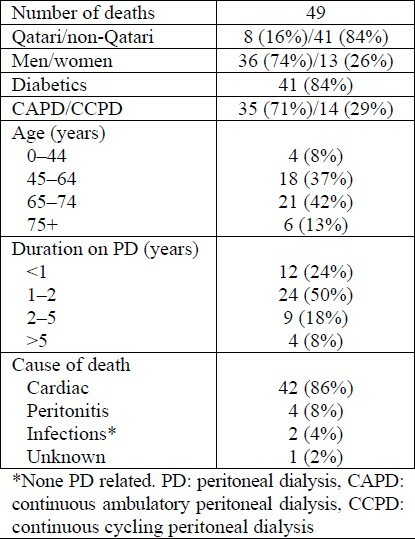 On the other hand, 26 patients were transferred from HD to PD during the same period; most of them were males (81%), and the reasons for transfer included vascular accesses failure, patients' requests, and the presence of unstable cardiac illnesses seen in 50%, 35%, and 15% of patients, respectively [Table 3]. Table 3: Reasons for patients' transfer to alternate dialysis therapy. A total of 32 patients left PD for kidney transplant, a figure that did not statistically influence our patients' outcome. Furthermore, the increase in the number of the patients who were lost to follow-up did not reach a statistically significant figure [Figure 3]. During the study period, our peritonitis rate was low with a mean incidence of 0.24 ± 0.1 episodes per patient year. The estimated annual 5-year survival rates were 91%, 77%, 54%, 38% and 26%. Our annual technique survival was dropping rapidly with time to 84%, 56%, 50%, 32% and 11% at the fifth year. There was no statistically significant difference regarding patient and technique survivals [Figure 4]. Figure 4: Patient and technique survival. By the end of the study, 76 patients remained on PD; 80% were non-Qatari expatriates, 74% were males, 26% were on CCPD, whereas 74% were on CAPD. Our youngest patient was 1 year old, whereas the eldest was 88 years, with 55% of ages ranging from 45 to 64 years and 22% were above 65 years of age. Seventy percent of patients were high or high average transporters; about three-quarters of patients were relatively new, i.e. had been on PD for less than 2 years, whereas only 8% were on PD for more than 5 years. Looking into our patients' investigations 75% were persistently attaining hemoglobin levels of more than 11 g/dL and 61% maintained serum albumin levels greater than 35 g/L. Regarding dialysis adequacy, 89% of the patients had weekly Kt/V urea levels of more than 1.78. Our results revealed that PD in Qatar expands by a mean annual rate of 12%, which is comparable to most governmentally supported centers, where PD utilization ranges from 11 to 47%. Most of our patients were non-Qatari male expatriates, a group that favors a mode of dialysis that can be self-administered, secures the ability to work, or travel, requires less dietary restrictions and potentially decreases the hospital and medical cost. All age groups were accepted into our program. The majority of our patients were diabetics, with diabetic nephropathy being the commonest cause of ESKD. Kidney transplantation in Qatar is still limited due to organ shortage. There had been a great fluctuation in the number of those who left PD for kidney transplant, being mostly dependent on the availability of organ donors. Most of the performed transplants used living unrelated organ donations. This study is important for healthcare planning and allocation of resources for RRT. Continued expansion of the dialysis population is expected in Qatar due to the increase in the elderly population with increased life expectancy and prevalence of diabetes in addition to the reduced number of kidney transplants. The high number of patients with diabetic nephropathy highlights the importance of aggressive primary management of diabetes mellitus and its complications. In our unit, few patients remained on PD beyond 5 years despite the low incidence of peritonitis and the high adequacy of dialysis. Our 1- and 5-year survival was low, possibly due the high incident diabetics and elderly patients. We would like to acknowledge Hamad Medical Corporation for supporting this work and providing us with all the necessary data. 1. Human Development Report 2007/2008-Country Fact Sheet-Qatar; Available from http://www.hdrstats.undp.org. 2. US Renal Data System: USRDS 2004 Annual Data Report. Am J Kidney Dis 2005;45(Suppl 1): 8-280. 3. Rashid A, Abboud O, Taha M, El-Sayed M. Renal replacement therapy in Qatar. Saudi J Kidney Dis Transpl 1998;9(1):36-9. 4. Twardowski ZJ, Nolph KD, Prowant B, Ryan L, Moore H, Nielsen MP. Peritoneal equilibration test. Perit Dial Int 1987;7:138-47. 5. Castillo AA, Lew SQ, Smith AM, Whyte RL, Bosch JP. Discrepancies between adequacy goals in peritoneal dialysis: role of gender. Am J Kidney Dis 2002;40:1301-5. 6. Van Olden RW, Krediet RT, Struijk DG, Arisz L. Measurement of residual renal function in patients treated with continuous peritoneal dialysis. J Am Soc Nephrol 1996;7:745-8. 7. Horl WH, de Alvaro F, Williams PF. Healthcare systems and end-stage renal disease (ESRD) therapies: an international review: access to ESRD treatments. Nephrol Dial Transplant 1999;14 (Suppl 6):10-5. 8. Moeller S, Gioberge S, Brown G. ESRD patients in 2001: global overview of patients, treatment modalities and development trends. Nephrol Dial Transplant 2002;17:2071-6. 9. Szeto CC, Wong TY, Chow KM, Leung CB, Li PK. Dialysis adequacy and transport test for characterization of peritoneal transport type in Chinese peritoneal dialysis patients receiving three daily exchanges. Am J Kidney Dis 2002; 39:1287-91. 10. Szeto CC, Wong TY, Chow KM, Leung CB, Li PK. Are peritoneal dialysis patients with and without residual renal function equivalent for survival study? Insight from a retrospective review of the cause of death. Nephrol Dial Transplant 2003;18:977-82. 11. Maiorca R, Vonesh EF, Cavalli PL, et al. A multicenter, selection-adjusted comparison of patient and technique survivals on CAPD and hemodialysis. Perit Dial Int 1991;11:118-27. 12. Prasad N, Gupta A, Sharma RK, Prasad KN, Gulati S, Sharma AP. The spectrum of bacterial peritonitis in CAPD patients in a developing country: is it different? Perit Dial Int 2003;23: 400-2. 13. Lok CE, Oliver MJ, Rothwell DM, Hux JE. The growing volume of diabetes-related dialysis: a population based study. Nephrol Dial Transplant 2004;19:3098-103. 14. Gokal R, Figueras M, Olle A, Rovira J, Badia X. Outcomes in peritoneal dialysis and haemo-dialysis: a comparative assessment of survival and quality of life. Nephrol Dial Transplant 1999;14 (Suppl 6):24-30. 15. Opatrna S, Sefrna F. Development of peritoneal dialysis and renal replacement therapy in the Czech Republic since the postcommunist transition. Perit Dial Int 2007;27:196-202. 16. Collins AJ, Wenli Hao Ms, Ebben JP, Everson SE, Constantini EG, Ma JZ. Mortality risks of peritoneal dialysis and hemodialysis. Am J Kidney Dis 1999;34:1065-74. 17. Piraino B, Bailie GR, Bernardini J, et al. ISPD Guidelines/Recommendations. Peritoneal dialysis-related infections recommendations: 2005 update. Perit Dial Int 2005;25:107-31. 18. Abdel-Rahman EM, Wakeen M, Zimmerman SW. Characteristics of long-term peritoneal dialysis survivors. Perit Dial Int 1997;17:151-6. 19. Warady BA, Fivush BA, Alexander SR. Peritoneal dialysis. In Barratt TM, Avner ED, Harmon WE, eds. Pediatric Nephrology. 4 th Ed Baltimore: Williams and Wilkins; 1999:1251-65. 20. Heaf JG, Lokkegaard H, Madsen M. Initial survival advantage of peritoneal dialysis relative to haemodialysis. Nephol Dial Transplant 2002;17: 112-7. 21. Churchill DN, Thorpe KE, Nolph KD, et al. Increased peritoneal membrane transport is associated with decreased patient and technique survival for continuous peritoneal patients. J Am Soc Nephrol 1998;9:1285-92. 22. CANADA-USA (CANUSA) Peritoneal Dialysis Study Group. Adequacy of dialysis and nutrition in continuous peritoneal dialysis: association with clinical outcomes. J Am Soc Nephrol 1996;7: 198-207. 23. K/DOQI Clinical practice guidelines for peritoneal dialysis adequacy. Am J Kidney Dis 2006; 48(Suppl 1):98-129. 24. Lo WK, Bargman JM, Burkart J, et al. Guide-line on targets for solute and fluid removal in adult patients on chronic peritoneal dialysis. Perit Dial Int 2006;26:250-2. 25. European best practice guidelines for peri-toneal dialysis. Nephrol Dial Transplant 2005; 20(Suppl 9):24-7.